Home News Woods Rules & His 2019 Hero World Challenge Will Take Player Preference Over Australian Open. Woods Rules & His 2019 Hero World Challenge Will Take Player Preference Over Australian Open. 4 months ago by Bernie McGuire Comments Off on Woods Rules & His 2019 Hero World Challenge Will Take Player Preference Over Australian Open. It was a question that was asked of Tiger Woods at last week’s Hero World Challenge and it was a question that just happen to pop-up in Melbourne when the 2019 USA Presidents Cup captain hosted a press conference. In twelve months time, the 2019 Presidents Cup will be staged in the week following the Woods hosted Hero World Challenge. We saw last week the logistical problems in getting from Nassau in the Bahamas when Woods used his own private jet to fly immediately after handing the trophy to Spain’s Jon Rahm to Los Angeles Airport so that he could connect with an 11pm Sunday night local time departing Qantas flight to Melbourne. Woods along with his girlfriend and management team, and having crossed the International dateline in heading ‘Down Under’, did not arrive to 10am Tuesday morning thus completely missing Monday. Tiger Woods in Melbourne ahead of the 2019 Presidents Cup. It is for this very reason next year Woods has already been in talks with the PGA Tour and sponsors Hero for the 2019 Hero World Challenge to end on a Saturday rather than Sunday. 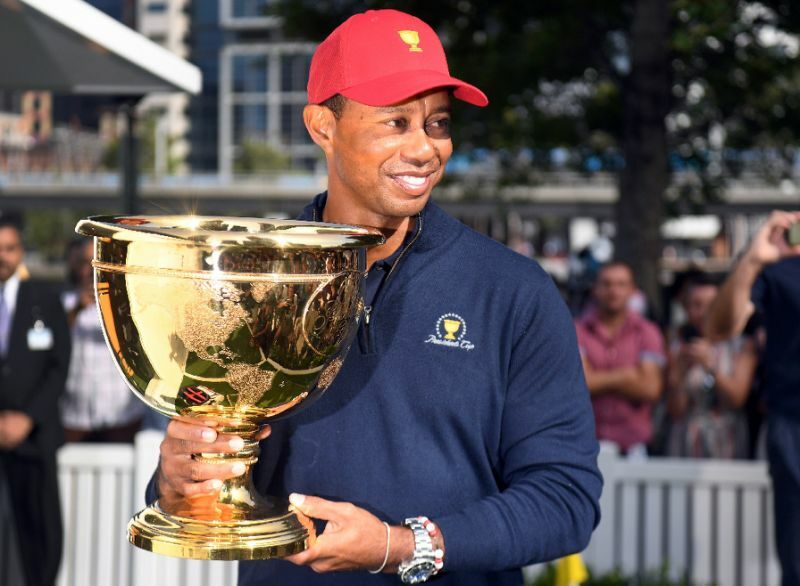 Woods indicated a Saturday finish in 2019 to the $3m event will mean that all USA Presidents Cup team members can meet in L.A on a Saturday night and board as a team the flight together so as to arrive in Melbourne on the Monday, and thus providing three days of official practice. It thus spoils the hopes of Australian Open organisers in attracting the best American-born players to compete the week prior in the 2019 Australian Open. Woods was quizzed in Melbourne Wednesday if he would hope his compatriots would play in the Australian Open or the Hero World Challenge. “Well, I hope they play at the Hero World Challenge. That’s an obvious one,” said Woods. “But we’ll see what happens. We have to figure out some logistical things between now and then. That’s one of the reasons why I’m here, to try and figure that out. When the Presidents Cup was last played at Royal Melbourne in 2011, the Australian Open was also played the week before in Sydney and it attracted a dream field but then it was not clashing with Tiger’s tournament. Those Americans who competed included Woods, Bubba Watson, Dustin Johnson, David Toms, Nick Watney, Hunter Mahan and Bill Haas plus their Cup captain Fred Couples and his assistants Bill Haas and John Cook. While International captain Ernie Els says he wants his team to be playing at the Australian Open, Woods is certain to attract his US players to the Bahamas. And with so much on offer in the Bahamas to benefit his own TGR Foudation why shouldn’t he?